Costly service: Containers being offloaded on to a truck at JN port. Bangalore: Jawaharlal Nehru Port Trust (JNPT) has mandated chartered accountancy firm N.K. Shah and Associates to audit the rates charged by Speedy Multimodes Ltd, now renamed DBC Port Logistics Ltd, after complaints that the country’s biggest container freight station (CFS) by capacity was overcharging customers. DBC services the Union government-controlled JN port, which handles more than half the container cargo passing through the country’s ports. Three other JN port officials confirmed the development but requested anonymity as they are not authorized to speak to the media. A spokesman for JN port declined to comment. Mahendar Puri, DBC managing director, said the company had complied with all the terms and conditions of the licence agreement. 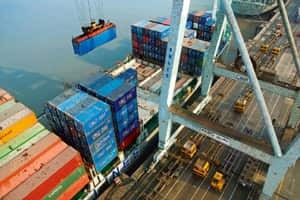 “Even though we have been advised that under the licence agreement JNPT is not entitled to do so, in the spirit of transparency we are fully cooperating with the said firm of chartered accountants. Since their exercise is currently under way, we cannot comment on specifics," Puri said in an emailed response on Wednesday. DBC Port said in another email that the “licence agreement does not prohibit us from dealing directly with the shipping lines or their agents. On the contrary, it expressly contemplates such dealings." The company also emailed a legal opinion by a retired chief justice of the Madras high court that supports its position. DBC said a detailed reply to the JN port showcause notice had been made on 11 November and that it had not heard back. “We have been mandated by JN port to carry out an audit of all transactions of Speedy after it started operating the CFS to find out whether complaints of excess billing and other violations are true or not," said Nainesh Shah, proprietor of NK Shah and Associates. Based on the report of NK Shah and Associates, the board of trustees will decide the further course of action, Raja said. A container freight station is a facility licensed by the customs department to help decongest a port by shifting containerized cargo and customs-related activities outside the port area. Due to customs procedures and space constraints at India’s ports, clearance takes place at such facilities. Of the 29 container freight stations that service JN port, only Speedy’s tariffs are regulated by TAMP. This is because the 68-acre facility is owned by JN port and was given to Speedy on an operation-and-maintenance contract for 20 years beginning 1 January, 2006. TAMP decides the rates at Union government-owned ports. Mint reported on 21 August that JN port had started an investigation into Speedy’s billing practices, following complaints. Speedy had earlier failed to convince TAMP to raise the rates it can charge. In October, JN port issued a show-cause notice to Speedy asking it to explain its position and say why the contract should not be terminated for violation of tender conditions. TAMP, which also received complaints from users, advised JN port to “examine the matter and take necessary action to ensure that the provisions of the Major Port Trusts Act, 1963, and the licence agreement entered into between JN port and Speedy are strictly complied with," a spokesman for the regulator said. Not only was Speedy over-charging customers but the rates were being collected by a third-party agency, ARR Maritime and Allied Services Pvt. Ltd, in violation of the agreement, JN port’s chief manager (operations) S.N. Maharana said in the 19 October notice. “Under the above-mentioned circumstances, as it has been observed that you are in gross violation of the licence terms and conditions and that such violations are construed as default under clause 4.35 of the license agreement, hence, this show cause notice is being served upon you to explain, as to why action cannot be initiated by JN port against you for termination of the licence by issuing 180 days notice," Maharana wrote in the notice to Speedy. DBC said in the email sent to Mint that its “relation is with ARR Maritime, the carrier’s agent, and not with the carrier directly. The internal arrangement between the carrier and its agent does not come under our purview." The company said, “We have no control over the tariff charged to its customers by M/s ARR Maritime, which is an independent autonomous company registered under the Companies Act, 1956." In the 11 November reply to the showcause notice issued by JN port, Puri said, “We strongly deny that we have committed any violations that would be construed as being default under clause 4.35 of the licence agreement." Mint has reviewed copies of both the show-cause notice and Speedy’s reply.